"Much of Mars is covered with dust, and we had an incomplete understanding of its mineralogy," said David Bish, CheMin co-investigator with Indiana University in Bloomington. "We now know it is mineralogically similar to basaltic material, with significant amounts of feldspar, pyroxene and olivine, which was not unexpected. Roughly half the soil is non-crystalline material, such as volcanic glass or products from weathering of the glass. " Bish said, "So far, the materials Curiosity has analyzed are consistent with our initial ideas of the deposits in Gale Crater recording a transition through time from a wet to dry environment. The ancient rocks, such as the conglomerates, suggest flowing water, while the minerals in the younger soil are consistent with limited interaction with water." NASA's Jet Propulsion Laboratory, a division of Caltech in Pasadena, manages the project for NASA's Science Mission Directorate, Washington, and built Curiosity and CheMin. This graphic shows results of the first analysis of Martian soil by the Chemistry and Mineralogy (CheMin) experiment on NASA's Curiosity rover. The image reveals the presence of crystalline feldspar, pyroxenes and olivine mixed with some amorphous (non-crystalline) material. The soil sample, taken from a wind-blown deposit within Gale Crater, where the rover landed, is similar to volcanic soils in Hawaii. Curiosity scooped the soil on Oct. 15, 2012, the 69th sol, or Martian day, of operations. It was delivered to CheMin for X-ray diffraction analysis on October 17, 2012, the 71st sol. 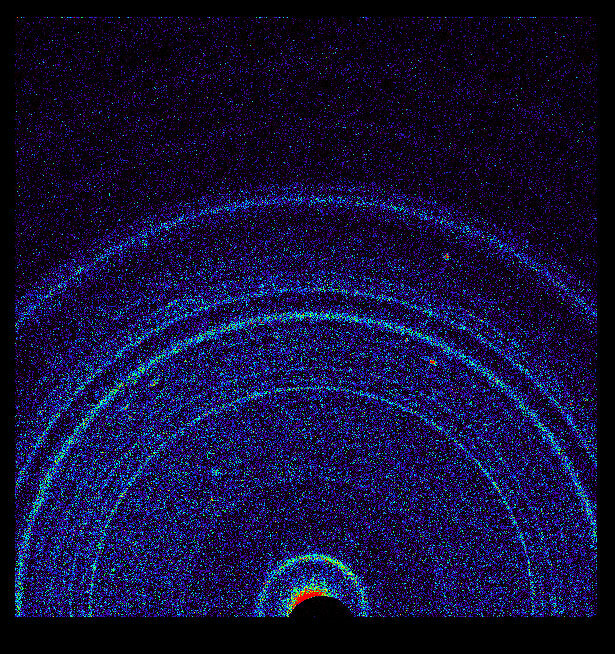 By directing an X-ray beam at a sample and recording how X-rays are scattered by the sample at an atomic level, the instrument can definitively identify and quantify minerals on Mars for the first time. Each mineral has a unique pattern of rings, or "fingerprint," revealing its presence. This pair of images from the Mast Camera on NASA's Curiosity rover shows the upper portion of a wind-blown deposit dubbed "Rocknest." The rover team recently commanded Curiosity to take a scoop of soil from a region located out of frame, below this view. The soil was then analyzed with the Chemistry and Mineralogy instrument, or CheMin. The colors in the image at left are unmodified, showing the scene as it would appear on Mars, which has a dusty red-colored atmosphere. The image at right has been white-balanced to show what the same area would look like under the lighting conditions on Earth. The rounded rock located at the upper center portion of the images is about 8 inches (0.2 meters) across. 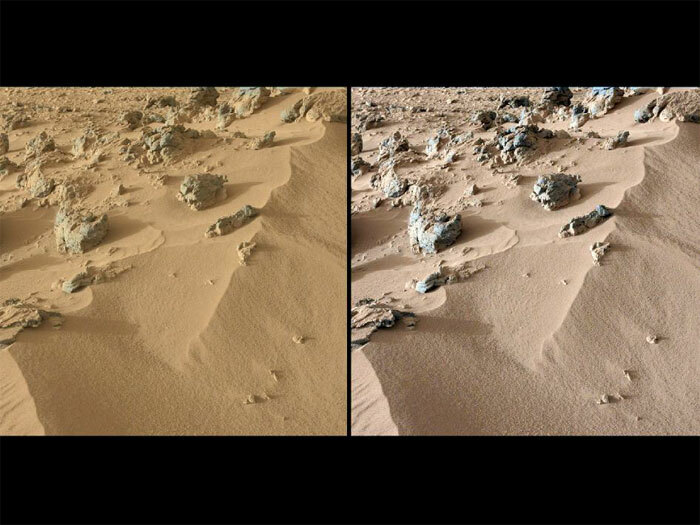 This pair of images shows a "bite mark" where NASA's Curiosity rover scooped up some Martian soil (left), and the scoop carrying soil. The first scoop sample was taken from the "Rocknest" patch of dust and sand on Oct. 7, 2012, the 61st sol, or Martian day, of operations. 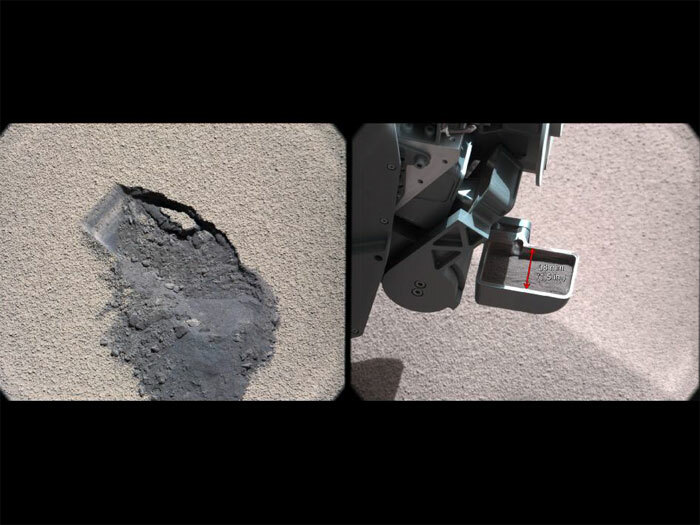 A third scoop sample was collected on Oct. 15, or Sol 69, and deposited into the Chemistry and Mineralogy (CheMin) instrument on Oct. 17, or Sol 71.